And it is completed – Couture baby, woooooo!! I enjoyed working on this garment so much more than I ever thought I would. The 8 other ladies I took Susan Khalje’s Classic French Jacket class with were an absolutely delight to work with, and I’m so looking forward to seeing theirs completed (come on girls!! I want pictures!!). Thank you guys so much for such a wonderful week! 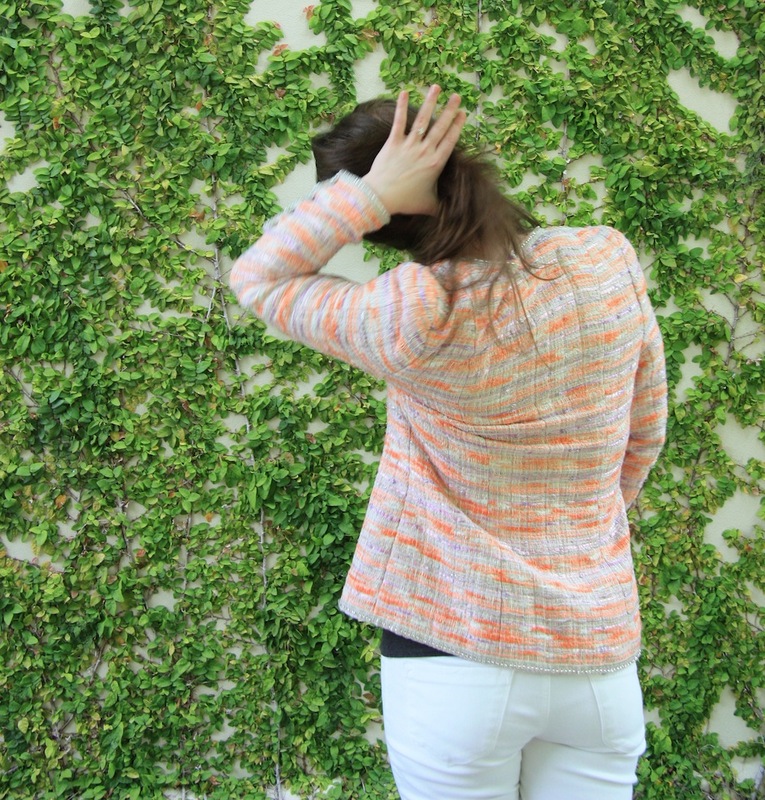 Despite the seriously close fit in an unrelenting woven fabric, there’s plenty of movement available for a hair flick. The total time spent? 153 hours, including preparation of the muslin which I had to bring along to class. The only parts stitched with a machine on this was the quilting lines, the vertical seams on both the bodice and sleeves, the shoulder seams and the stay stitching around the neckline. 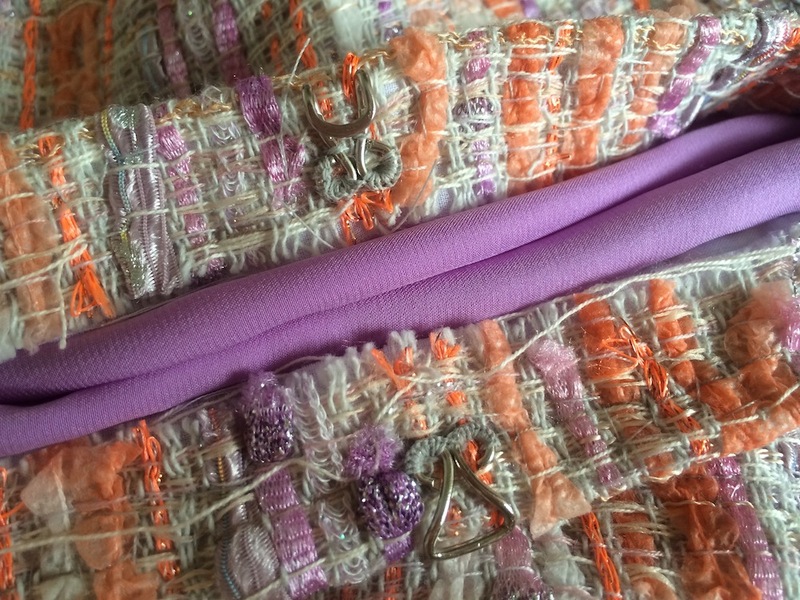 The rest is entirely hand stitched…. I’m clearly a slow sewist. Taking this class was absolutely enthralling – and I now truly understand why this garment has held so much fascination to sewers over the years – it really is a subset of couture in its own right. Virtually everything about the construction of this garment was new to me, and I was riveted the whole way. Nothing is wasted, even though it seemed awfully extravagant to cut out such massive seam allowances. 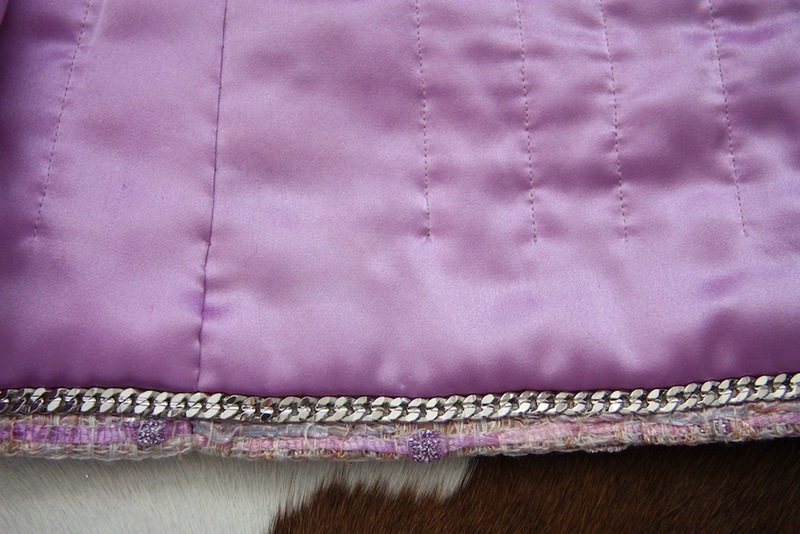 I think what amazed me the most is how those seam allowances were utilised throughout the garment, like at the armscye – simultaneously providing the role of a sleeve head and a light shoulder pad at the same time, as well as in the princess seams to provide strength and stability to the body of the jacket. 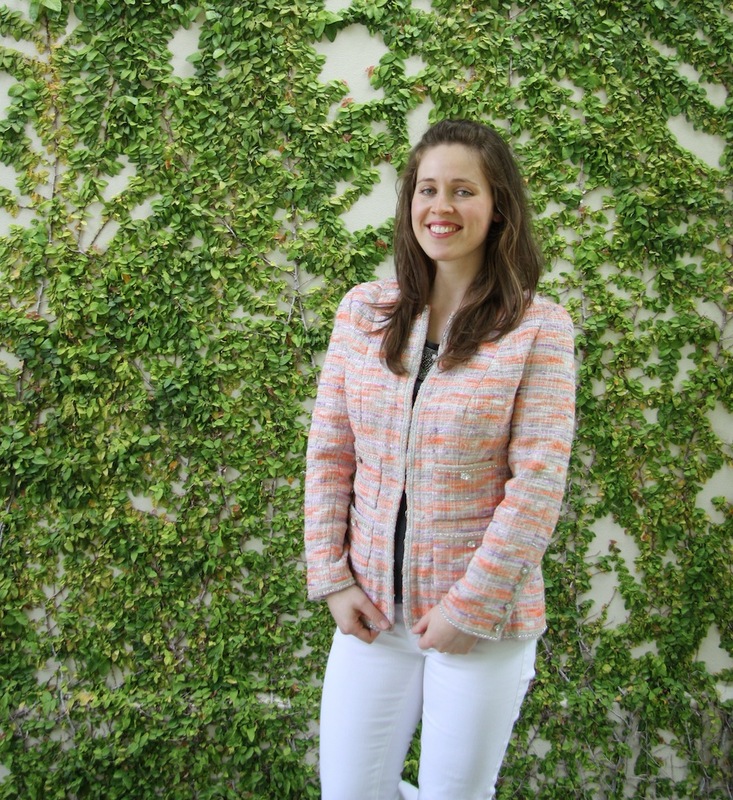 I’m tempted to call it a cardigan more than a jacket – because that’s how it feels (and how it should feel, too). It’s so much less of a jacket than I originally thought it would be. And yet, just look at the shape – nary a shoulder pad in sight – gorgeous. The fabric is a loosely woven Chanel boucle, bought from Mendel Goldberg – and the reason I figure I can get away calling this post what I have. 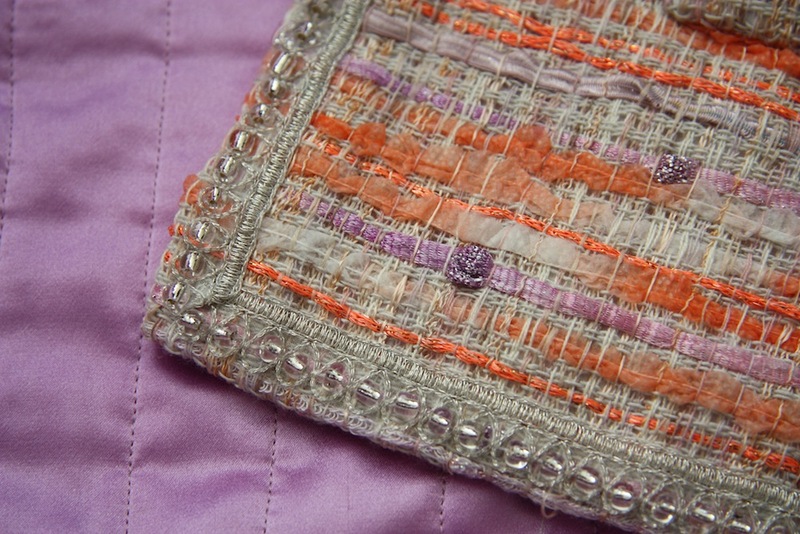 It’s lined in a lilac silk charmeuse from B&J fabrics, and my trim – bling-y buttons and a silvery grey beaded thing was from M&J Trimming, all from New York. 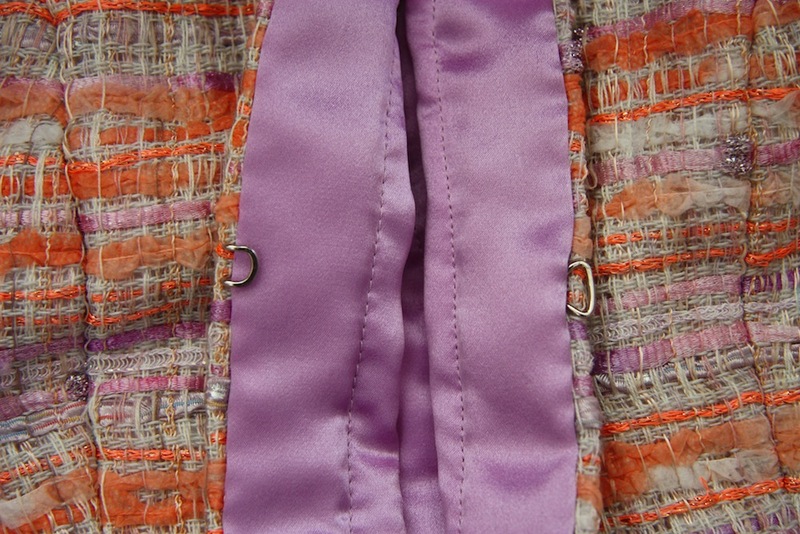 I was originally planning on having two rows of trim with potentially some orange velvet ribbon in the middle, but when it came to pinning it on the jacket, it just looked too much and the orange of the ribbon too harsh. Thanks to all the girls from Social Sewing for their general consensus advice on this matter of crucial importance! So, one row of trim it was. My first (half lousy, half good) and second attempt at sewing on the hardware. Such a shame the pretty stitches are then covered up by the lining! Click to Enlarge. And the fit? Well, it’s probably the best fitting thing I’ll ever own, assuming I don’t put on or lose weight. The jacket is definitely snug, but super comfortable at the same time. It wasn’t all smooth sailing however. One of my favourite anedote of Susan’s from my time in Baltimore was hearing her voice her disappointment when she got her white-gloved hands on some historical couture pieces from this and last century whilst at a museum in France (I forget which one) because not only did the pieces have little quirks – they had flaws. I think that’s a prudent reminder that even at the top tier, garments sewn with the utmost of skill can be imperfect. The pursuit of perfection is soul killing? Either way, she said that anything sewn by a person is going to have human aspects to it – those little imperfections that make us what we are. Now, my jacket has a few imperfections, for sure. But these are learning experiences, and the next one I make will be that much better for it. Like – if you have a non-symmetric trim, it would probably be a good idea to make sure you get it the right way up all the time. Unfortunately for me, I only realised this after sewing the trim on #3 of my four pockets. It would have potentially ruined the fabric and the trim to unpick it, so… eh. 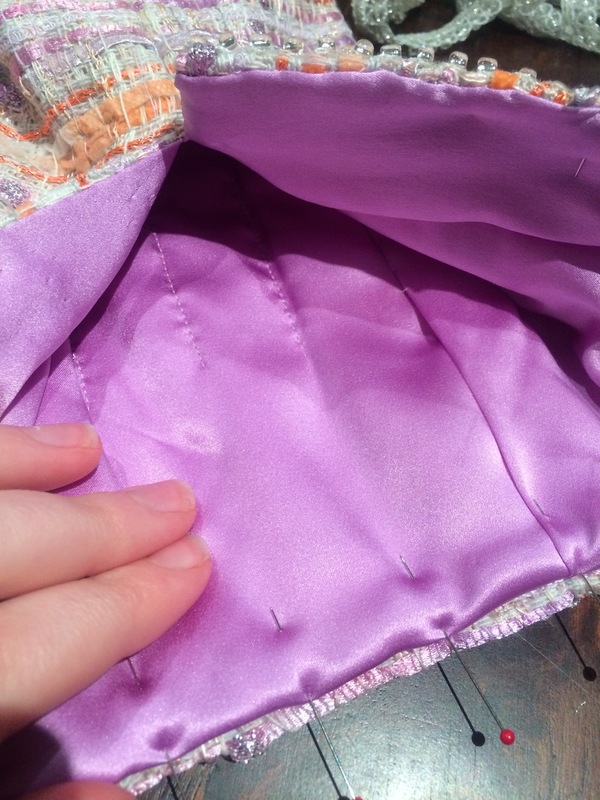 I ended up quilting my pockets as well – with the lining fell stitched to the pockets, then fell stitched onto the jacket. It was a mission not to let any of the stitches show through on the lining. But! These are entirely functional pockets, woo! So there’s the little imperfections we can live with, and the ones we can’t… like how I got within inches of finishing sewing on my chain, only to line it up and realise that I hadn’t been pulling the blasted thing taught – the links were all squished up next to each other and as a result I was 2 inches short from having the chain meet the other side of the jacket. I downed tools at that point and went off to kill some demons in Diablo III to vent my frustration. I came back later to unpick and resew, but also managed to work out a much faster and more even way to sew the chain the second time around! Ah, the good ol’ learning curve. Regardless, I don’t think I’ve ever enjoyed sewing a garment more than I have this. Am I hooked on sewing these? Definitely. I’ve already bought a gorgeous blue boucle as I’d really like to make one of these for my mum. Let’s just add that to the post-wedding-dress sewing queue, alrighty? wow, this is really a beautiful jacket, and you look so happy with it! I am still not sure if this style would be for me, but I would like to sew one just for the construction techniques. Thanks for showing so much details. I have learned a lot. You’ve done a beautiful job and it looks super on you! Thanks for sharing your experience, I know how wonderful it is. Thanks Wendy :) I hope you enjoy your upcoming french jacket class as much as I enjoyed mine! Hello couture goodness! Mel, this is absolutely STUNNING and even more than that it is a story and a memory and an experience all rolled in to one. This garment will hold so many stories AND look absolutely fierce- isn’t that what this sewing caper is all about? So. Dang. Cool. It looks gorgeous and fits you to perfection. You must be very proud of yourself! Oh it looks stunning. What a great moment. Congratulations Melanie. This jacket is divine and I am so proud of you, Plus you look radiant in it. All those miles you traveled and hours you have put into this beautiful French jacket have been so worth it. 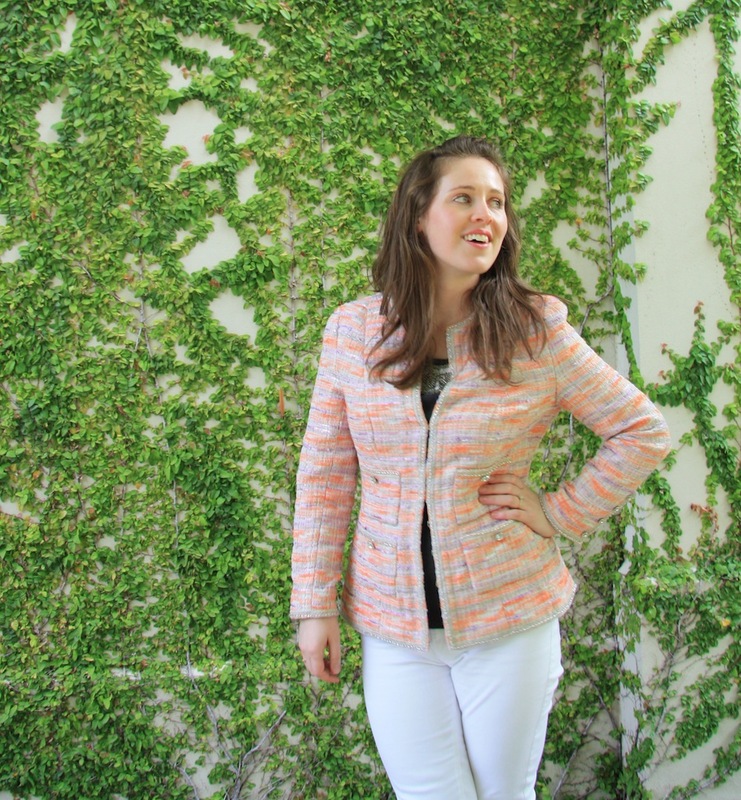 And not only that, you have inspired so many home dressmakers with your wonderful and informative blog about the process in making this jacket. Thank-you Melanie so much for sharing. And now I am off to the Chanel shop in Brisbane to have a serious look at a jacket!!! Do you mean for $6000 I won’t get hand quilting???? Air high-five to you! 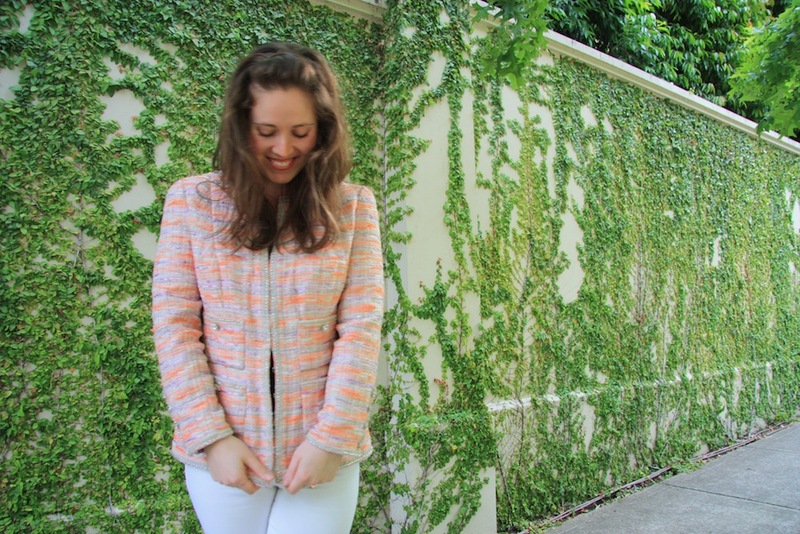 You’re jacket looks fabulous and your smile suggests you feel pretty damn fabulous in it too. What a wonderful experience and journey. Unforgettable I’m sure. This is so beautiful! Making this superb jacket must give you such a boost of sewing confidence. Can’t wait to see your wedding dress! Thanks Marianne! Oh absolutely. Very much looking forward to seeing how your LFJ comes together through the sewalong! That 153 hours of yours make me wonder if it wouldn’t be better to postpone this project till after the holidays! I don’t want to rush it and squeeze it in between too much other jobs that have to be done. Perhaps it will be better to keep it for those long dark January nights…. Just take it one step at a time… a little bit here and a little bit there. Don’t get frightened by the whole thing as one! Work through it in your own time and enjoy the process :) If that means January sewing… then so be it! This is just awesome Mel. How on earth did you manage to stay focused with all that hand stitching for 153 hours!! nuts!! 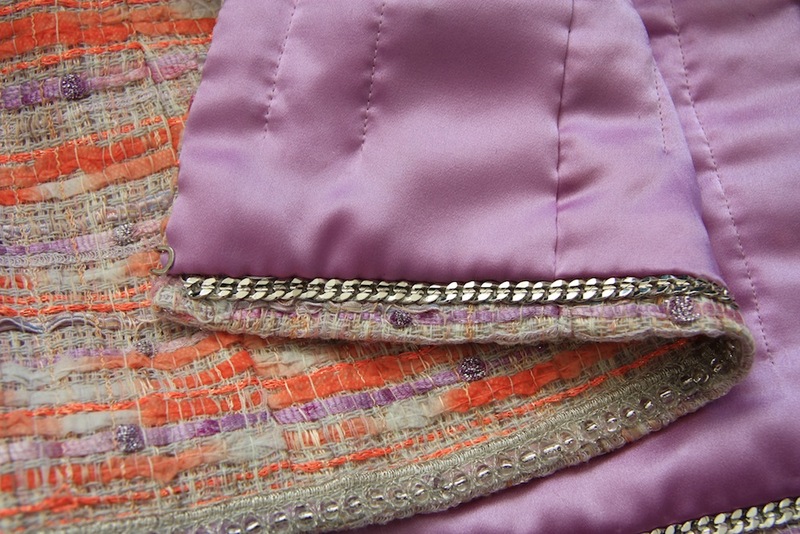 Wow, absolutely stunning couture jacket, the work and effort was worth every minute! I’m completing the pockets on mine as I write this. Omg this is amazing!!! I’ve been hanging to see this finished for so long. I love the fabric. All the little details you added and just perfection. You did a fantastic job! Wow, wow, wow! Loving the jacket and your beaming smiles. Looking forward to seeing the jacket in person soon. Such a fun series of posts to read. Thanks for taking the time to share. Beautifully done. The vented sleeves are particularly special. STOP IT. Also, I can’t believe you are going to do another one. I expect you are equal parts mad and fabulous. That is so amazing. You are a couture queen! But how could I not? Must. Consolidate. The. Skillz. I am speechless. That doesn’t happen very often! It is a thing of pure beauty. What a fabulous experience and jacket. V7975 is on my table right now. A black version. I can’t decide about the fit across the shoulders. I’d love to take it in more but am wary as the last work jacket I made (Cordova) is like a straight jacket. Any tips?? Amazing jacket once again! Well done. Just too beautiful for words. I am in awe of your patience and skills Miss Melanie :) Also love that you are rocking it with jeans! Great to finally see this fabulous jacket on you! I found your posts on the construction of this jacket very interesting to read. Thanks Lisa! I won’t lie – I’m VERY aware of it when wearing it. I’m actually wondering if I might have to take the front pocket buttons off, because already they’ve caught lightly on the sleeves a few times. I have heart palpitations just thinking about potentially ripping some of those loosely woven threads out… My next one will be uber practical and hardy, you can bet on that. Now that is gorgeous. Well worth all of your hard work. I have been hanging out to see this and it is truly a work of art. Wow, I only hope mine can be a fraction as good as yours. I will be studying the pictures closely for the tiny details as I work through mine. Congratulations on a beautiful job. What a beautiful jacket! I am extremely envious of your classes with Susan, hopefully one day I will get to go to one of her classes. I am so impressed with your jacket. This is just incredibly gorgeous!!! I don’t really have any words for it! Haha! Just as a garment, the finishing and technique and details are totally superb (and I’m sure completely worth all the knowledge you attained!) But just as a jacket that’s part of your wardrobe, it’s stunning!! The color and fit is SO flattering on you, seriously! You look like you’re glowing in these pictures!! Perhaps both from pride AND a flattering color choice… Congratulations Melanie!!! Holy cow – this is STUNNING! What beautiful fit. What gorgeous lining. You will love this for a very long time, I’m sure. Congrats! That’s a stunning jacket and it does flatter you so nicely. Thanks for sharing your progress, that must be a looot of hand sewing. Gorgeous and you know I love that plaid matching ! Worth every hour. It’s beautiful!! The fit looks perfect! A better fitting garment has yet to grace my back… hehe. Thanks Kelly! Thanks Jo, it absolutely was and the memories that sit behind making this will be with me forever. It makes it just that little bit extra special! And I totally am! Amazing! I have so enjoyed the telling and the honest portraying of making such a garment. I wish New Zealand was a little closer and I would challenge myself with one of Susan’s classes. Thanks Robyn! I wish Australia was a little closer so I could go more often – ha! Very pretty! It is wonderful to see the finished garment on you after watching your progress. Oh my gosh, this is STUNNING! I love it! The fit is absolutely perfect! Really, really lovely, Mel. Oh wow, this is incredible! It’s already such a pretty jacket from far away but all of the details are just breathtaking! Congrats for finishing it!! Cheers, Ping! I’m pretty stoked all round, and super glad you like it :) Love your work! Gorgeous! You should be proud! Thank you so much for sharing this! I’m so inspired to start my own jacket. I’d love to take Susan Khalje’s class one day. And thanks for the anecdote about imperfections; I feel the same way about things made by hands: it just reminds me that someone took the time to do it. I used to get upset about flaws in my work, but now, as long as it isn’t major, I just shrug it off. The work that went into this is just… WOW. And you look fantastic in it. Holy moly it is amazing! And you look amazing in it. I am planning one very soon – need to find fabric – but am unsure about whether to couture-sew it or do more everyday-sewing. Yours is incredibly inspiring!! Fabric is definitely the hard part… trim and buttons potentially harder still, but I know you’ll find something :) Totally up to you on which sewing road to take… I would definitely recommend this one though! Especially with the little french jacket sewalong that Inna and Leisa are doing right now. All the resources you could possibly need ;) Thanks Rachel! What a gorgeous French jacket! 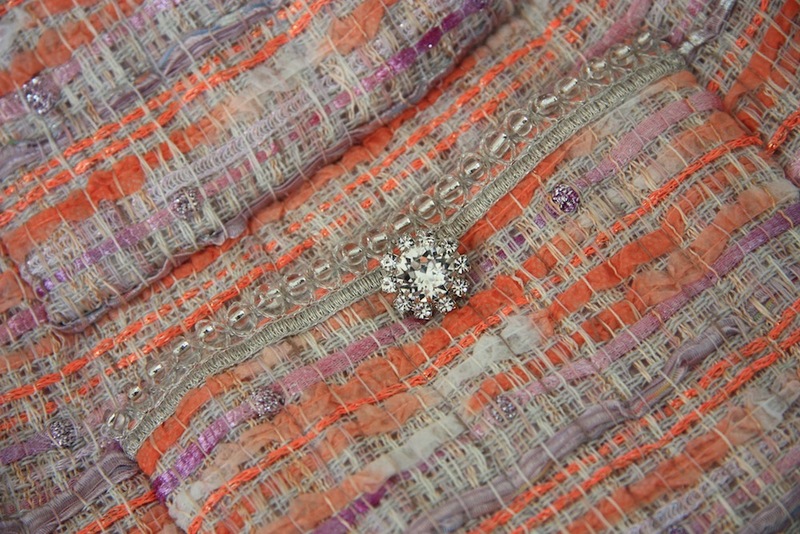 It looks fabulous on you, fabric, fit, trim…the whole enchilada is spectacular! Such an epic make – and I grin at the thought of how much you must have spun in front of the mirror once you finished it – and rightly so! I adore the shell fabric, it’s just gorgeous… even if it isn’t blue! You look so amazing in this beautiful jacket. I’ve been following along your construction posts and have been dying to see the finished jacket – it is totally worth all those hours of construction. Do you think the price of a Chanel jacket is justified now? Thank you so much, Kristy! And yes, I do think the price tag is justifiable. It’s all relative, really! If I were to take the time spent on this an multiple it by my hourly rate… well I just did and choked! This jacket is so beautiful and I’m sure you’ll treasure it for many decades or longer. 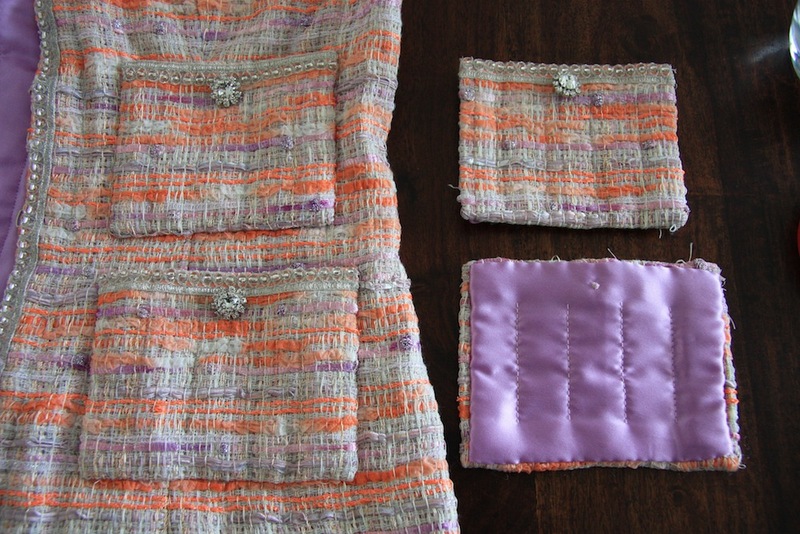 I really enjoyed following all your construction posts and you would have inspired so many other seamstresses to take on a challenge like this, including myself (though not just yet). I didn’t even know you could do courses like this! Here’s to embracing slow sewing and the lovely rewards that come with. Thank you Rosi! I absolutely will, and I’m so glad you’ve enjoyed the journey – I’ve enjoyed sharing it! Potentially being able to inspire one or more people to do the same is the icing on the cake. Cheers to slow sewing! It was worth the wait, Mel! Your jacket is oh so gorgeous and looks divine on you. So we have a new word for our mistakes, do we? … Human aspects….. I’ll remember that! Why don’t you ask Susan to send you more chain? I’m delighted I could see the jacket in process. Congratulations on a job masterfully done! Thanks Sarah! Luckily I realised I was sewing the chain links up close together instead of pulling the chain taught – so I unpicked and resewed and the chain now goes from end to end! Thank goodness for that! I know I have already swooned but really huge congratulations, I know just how hard you worked on this!! 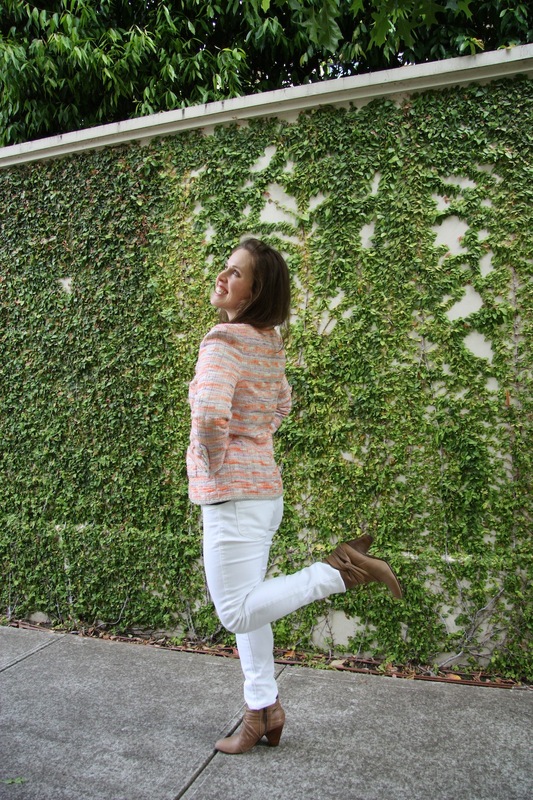 The matching is divine and the fit…..now onto that wedding dress, after this it will be a breeze!! p.s. i`m the lucky owner of two pre-loved RTW chanel jackets….one of which i had to take to bits in order to make it fit …..and I can say yours is so very very much better made! Hi Cazza – thank you! That’s really lovely to know – I like the concept behind that. Like you, I do this most everytime – more often unintentionally than not! Look at that fantastic back fit! I can’t look away, it’s so beautiful. Thanks for sharing your journey with us. I have to admit I screamed out loud a little bit when I read the bit about the chain…Diablo III sounds like the perfect break but I’m not sure I could’ve come back to that unpicking! Good for you for sticking it out! Aw, thanks so much! With the chain it was a case of… well I’ve come this far, I may as well do the last few hard yards!!! It nearly did me over, but my kill streak post chain-distress was phenomenal. haha!! I really love this delicious color–great choice!–especially with the purple lining. Congratulations on achieving such a sewing (and fitting!) milestone! Anything made in such a holistic experience would be worth gold to me. Details-wise, I especially love the shape of that shoulder–elegant. Thanks Amy! I’m so glad you like it :) The shoulders are my favouirite point, too. How they actually come to be through use of the seam allowances just blows my mind! Oh Melanie it is so very beautiful! Many congrats. The pursuit of perfection really isn’t worth it! It was a lovely anecdote, for sure. Just enjoy the process, and the result will speak for itself! Can’t wait to see how everyone’s jackets from the sewalong turns out :) And thank you! Wooot!!! I’ve been following along your ‘learning’ posts and looking forward to the finished product. I have to say, it’s absolutely perfect! Fits you really great as well. Nice work, you should be very proud. 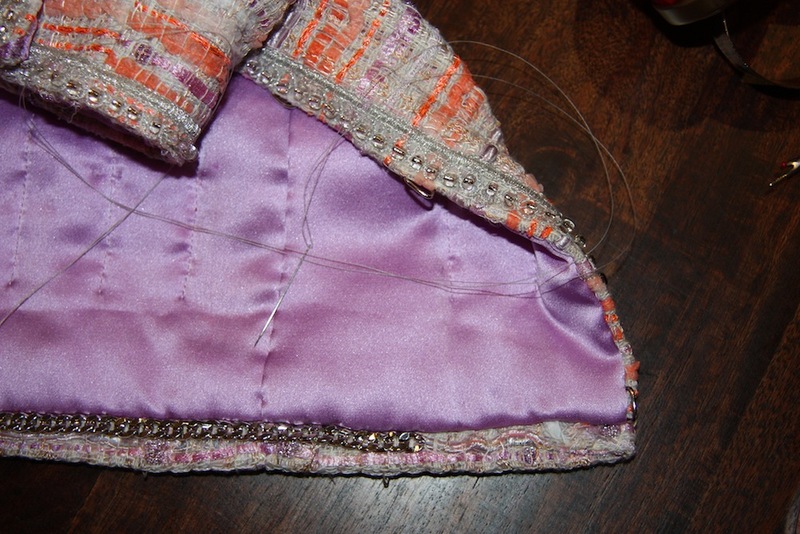 I’ve returned to garment sewing in the last 12 months and have been devouring sewing blogs. Your jacket is a culmination of the most important thing I’ve learnt from following you – to take pride and take your time to produce something beyond ordinary that you’ll love. Congratulations, your jacket is sublime! So glad you are thrilled with this gorgeous jacket, you can see your joy so clearly. Thank you for the detailed journey, the memories you have of this jacket will be with you always and the rest of us can come back here to enjoy and learn. Woooooh, it’s truly breath taking! I am truly intimidated by all the amazing details and I can’t WAIT to see it up close in person. Just breath taking!!! Aww thanks so much Julia! I’ll be wearing it for our upcoming dinner so you can try it on if you like ;) See you soon! OMG, your time and effort were definitely worthwhile and such a learning experience too! You have been so inspiring and whilst I can’t see me wearing a jacket in this style, to learn the couture techniques would be amazing. BTW, you are totally rocking that jacket, it really suits you. Um, WOW! That is not only the most amazing jacket I have ever seen, but also one heck of an impressive achievement! I take my hat off to you, lovely lady! What an epic sewing feat. You should be so proud of yourself. This jacket is just amazing. Thank you for sharing the whole process. Lovely. Just lovely. I am so thrilled to see you so happy in your finished jacket. I just love it! I really must figure out a way to take this class! Wear that jacket with pride!!!! Absolutely gorgeous! I am in such awe. I have always wanted to take this class from Susan. Enjoy your jacket for years to come. What an absolutely amazing achievement! You must be glad for this cool spring weather so you can get a bit of wear out of it before summer sets in :) And that colour on you is perfect! Very much so and on all accounts! Thanks so much Jenny :) Although the last few days have given me the taste of summer to come – bring on the sunshine! So beautiful! I thoroughly enjoyed reading about both of your couture sewing experiences. 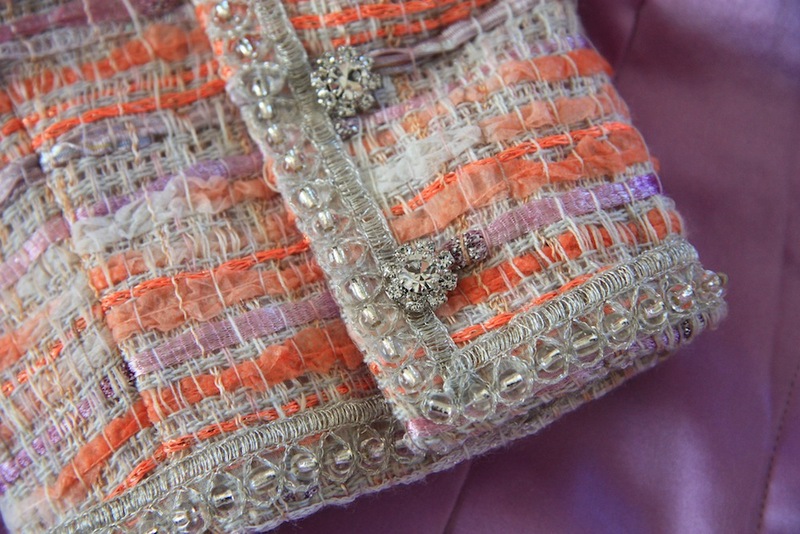 I will be taking Susan’s french jacket class in San Francisco next year — just signed up! — and reading your posts has been so fun. I can’t wait for my class! Enjoy your gorgeous jacket! 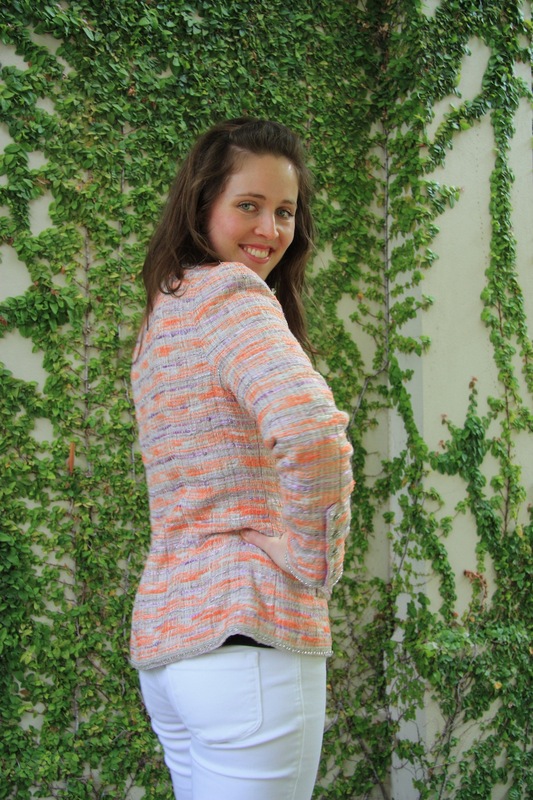 I don’t know how I managed to miss this post when it went up… But I am so excited to see your finished jacket! The amount of work is just mind blowing. And makes me feel like such a lazy bum for having not finished the insides of some bound button holes for the past few weeks. All of the details are magnificent – the finished jacket is just lovely. Definitely a garment to be proud of! This is The most beautiful jacket!! If I ever have a chance of a class with Susan Hale this post has shown me how wonderful it would be. The hand quilted lining is perfect!! I read about this technique used with boucle wool a la Chanel so am excited to see your example. Incredible….Your sewing is beautiful….. I am making a Mens version for me…. I’m not a seamstress. My research assistant is. We’ve been discussing the modern lack of respect for domestic skills and the clothing engineering required for women in the spotlight, such as First Ladies. She sent me this fabulous post. The jacket/cardigan looks lovely on you and I throughly enjoyed reading the pleasure you take in sewing as well as the commentary on well engineered clothes. Thank you, Leslie – it’s lovely to know there are still others out there who appreciate the skill and time required to produce good looking garments! I am researching as much as I can before beginning my Chanel jacket (I think my fear of starting is behind my seemingly never-ending research). I so appreciate your candor about your mistakes and redoing or not redoing and the whys behind it all. Thank you! This is absolutely beautiful! I was saying to Sarah I want to make one and she said ‘check out Mel’s blog, she did a whole class for it!’. Simply perfect. You’ve got me totally terrified and excited at the same time!